Writings on Music documents the creative journey of this thoughtful, groundbreaking composer. 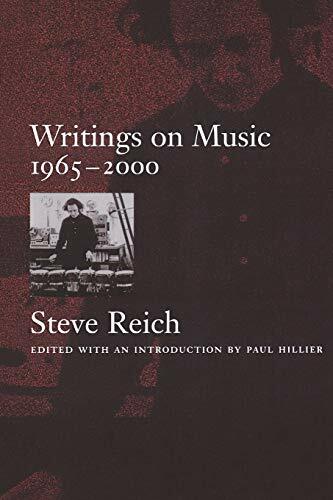 These 64 short pieces include Reich's 1968 essay "Music as a Gradual Process," widely considered one of the most influential pieces of music theory in the second half of the 20th century. Subsequent essays, articles, and interviews treat Reich's early work with tape and phase shifting, showing its development into more recent work with speech melody and instrumental music. Other essays recount his exposure to non-western music--African drumming, Balinese gamelan, Hebrew cantillation--and the influence of these musics as structures and not as sounds. 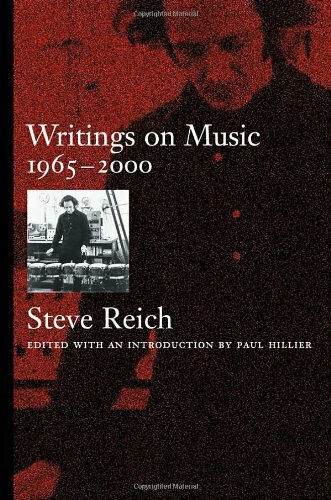 The writings include Reich's reactions to and appreciations of the works of his contemporaries (John Cage, Luciano Berio, Morton Feldman, Gyorgy Ligeti) and older influences (Kurt Weill, Schoenberg). Each major work of the composer's career is also explored through notes written for performances and recordings. Steve Reich, an artist who has gained international renown over the course of a distinguished career, was recently called "America's greatest living composer" by the Village Voice. The Guardian in London has written, "There's just a handful of living composers who can legitimately claim to have altered the course of musical history, and Steve Reich is one of them." He has received Grammy awards for Different Trains (1989) and Music For 18 Musicians (1998). His most recent work is the digital video opera Three Tales (2002) done in collaboration with video artist Beryl Korot exploring technology in the 20th century through the Hindenburg, the Bikini A-bomb tests and Dolly, the cloned sheep. Paul Hillier is a singer, conductor, and writer on music. Currently Director of the Early Music Institute at Indiana University, Hillier also directs the Theatre of Voices and is principal conductor of the Estonian Philharmonic Chamber Choir. He is co-founder of the Hilliard Ensemble and author of Arvo Part.